a green avocado: Finally a weekend at home and some summer muffins! Finally a weekend at home and some summer muffins! Saturday started with perfect blue skies and sun, ideal for catching some sun rays on the beach with a good friend. I managed to quickly bake a batch of summer muffins, to take with. Nothing better than a lazy summer afternoon spent talking, in company of heavenly tasting muffins! Unfortunately I forgot the camera to save those beautiful moments... So the photos here come from this morning, as usual my colleagues were tasting the remaining few pieces. 1. Combine sugar with butter, mix until butter gets soft and sugar partially dissolves. Add rhubarb pieces and mix again. 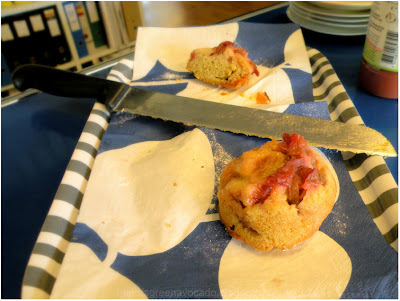 Place into bottoms of previously well greased muffin form (no muffin lining). 2. Using a food processor or mixer mix butter with sugar, then add an egg and stir until well combined. 3. Mix all the dry ingredients and then slowly add to the butter mixture - little by little alternating with milk. Lastly add orange zest. 4. Place in the muffin form on top of the fruit topping. Bake for 25min in 180 degrees. 5. 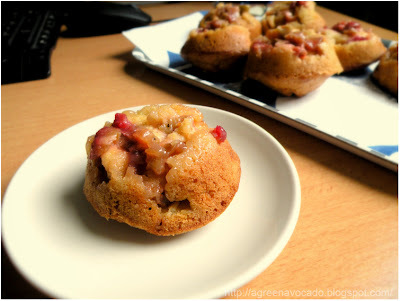 When baked, cool for 5min in the form, then gently take out each muffin and place up side down - with fruit topping on top (if needed for more stability, cut the bottoms even). Serve and enjoy! The muffins have a sweet-sour summer taste, they are very fluffy and light. I found this recipe in a Polish cooking magazine 'Kuchnia' and got an idea to experiment a bit and maybe one day changing those muffins into a cake.... Just have to wait for another weekend.